I have just returned from England where I was surprised to notice how many large trees are being felled by strangulation by ivy. 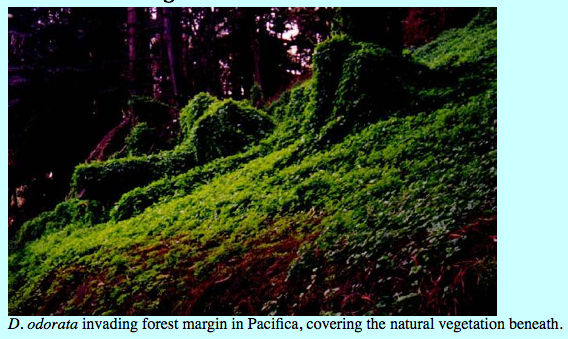 Whole forests were full of dead trees leaning precipitously but held in place by thick ivy. Some ivies develop trunks up to 6" in diameter and as the vines twist and grow around the trunk of the host tree they slowly stop that tree's ability to thrive. Occasionally I saw that ivy had been cut from large ancient oak trees, but that varied depending on the landowner. Ivy has had a long time to grow in England, but it has not been in California for very long, and see how prevalent it has already become. Just look at this horror, botanical name Delairea odorata. It's just like kudzu. This ivy climbs to the tops of trees and strangles them to death. It's interesting how many invasive plants have so much form in common with each other, growing solid green blankets over everything in their path. Drought tolerant plants are gaining popularity which is a good thing. However, drought tolerant plants tend to be more invasive than those that are tender or thirsty. Eschiumcandicans, Pride of Madeira is striking, a favorite for bees, but drops forests of seedlings that grow readily without irrigation. Fortunately it is easy to uproot. In any case we are going to have to be careful about adding non-native drought tolerant plants into our gardens. Some, such as Grevillea long john are hybridized and seem to be infertile. This is a complicated subject with little useful information out there for the novice or even expert gardener. Invasive ornamental plants such as common honeysuckle, Algerian ivy, Pennisetum, Arundo, and Pampas grasses, Periwinkle or Vinca major, and Spanish broom should never be planted because we know how easily they spread into wild lands, their seeds carried by visiting birds. These plants were once encouraged in California because they are extremely drought tolerant and are great for soil rentention. However, once rooted they will spread vigorously. The flora of the Big Sur coastline is being decimated as pampas grass becomes the monoculture on those dramatic cliffs. It is a pity that nurseries still sell many of these nuisance plants. A comprehensive list of invasive plants may be found on the California Invasive Plant Council website. As you can see here, it is impossible for any other plant to survive the strangulation from these fast growing vines.